Non Workout Days: On non-workout days, consume 2 servings (2 capsules) upon waking, and an additional 2 servings (2 capsules) approximately 6-8 hours later. This product is only intended to be consumed by healthy individuals 18 years of age or older. Pregnant or nursing women should not use this product. Consult with your health care provider before using this product, especially if you are taking any prescription, over the counter medication, dietary supplement product or if you have any pre-existing medical condition including but not limited to: high or low blood pressure, cardiac arrhythmia, stroke, heart, liver, kidney or thyroid disease, seizure disorder, psychiatric disease, diabetes, difficulty urinating due to prostate enlargement or if you are taking MAO-B inhibitor or any other medication, including but not limited to MAOIs, SSRIs or any other compounds with serotanergic activity. Do not combine with alcohol. Discontinue use and immediately consult your health care professional if you experience any adverse reaction to this product. Do not exceed recommended serving. Do not use if safety seal is broken or missing. User assumes all risks, liabilities or consequences respecting testing. Keep out of reach of children. Please store in a cool dry place. The expert formulators at iForce have just released a brand new version of their popular test booster with an all new formula and better ingredients. The new formula contains some little known ingredients that have the potential to provide great results. It also represents a typically unheard of price drop over its predecessor. This is a near complete makeover of the formula with many new ingredients, and just the venerable Vitamin D3 remaining. 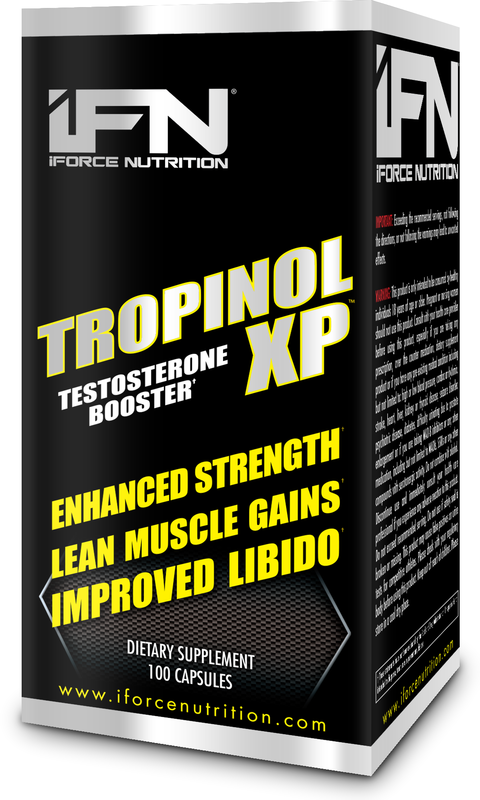 As a result, we've got lots of ground to cover in explaining why Tropinol XP is right for you: You're about to see why this product goes way beyond a test booster and is one of the best muscle-building products on the market today. Fadogia Agrestis is an herb that has been around for a few years and is shown in a couple (1, 2) of rat studies to boost testosterone as well as indicators of sexual function. There is limited human data, however anecdotal reports are promising. The targeted active ingredient in Epimedium; Icariin, is shown in some animal studies (1) to increase testosterone. It also acts as a PDE5 inhibitor, which explains its reputation as an aphrodisiac and the common nickname of Epimedium 'Horny goat Weed'. Additionally there are several other beneficial effects associated with epimedium such as neuroprotection and promoting bone tissue growth. Icariin has relatively low bioavailability on its own (around 12%) and you could improve the effects you'll see from this ingredient by supplementing additionally with capsacum[LINK?] or ecdysteroids (such as iForce Ecdy[LINK]). Icariin is also a vasodilator via inhibition of an enzyme named phosphodiesterase, this method of action has been shown to be synergistic with those of yohimbine with regards to 'male enhancement' effects. A bit of cheesy labeling here by iForce, this ingredient is more readily known as '6-keto diosgenin'. This compound has been around for a while but seen limited use due to scarcity and general lack of awareness. Some research was published in the 70s on its anabolic potential and the results were promising. This is an exciting and oft-overlooked compound that we're glad to see making its way into a product again. Focus mainly on the Nitrate here, nitrates are a rapidly growing supplement ingredient as numerous studies emerge demonstrating their positive effects on exercise performance. (1, 2, 3, 4, 5, 6). Nitrates increase blood flow, reduce oxygen cost of exercise, reduce phosphocreatine and ATP usage in muscle contraction, and cause ridiculous pumps. Forskolin belongs to a class of compounds called 'adenylate cyclase activators', which increase levels of the enzyme cAMP in cells. Forskolin is a highly potent and known cAMP enhancer and is routinely used in other studies targeting the effects of cAMP in cells. By increasing cAMP Forskolin has the potential to increase: testosterone, fat burning, muscle contractility, and muscle protein synthesis. All of those are areas of particular interest to athletes. Forskolin is also a great pump-inducing supplement. It is subject to the same metabolic shortcomings as Icariin, so again the recommendations to take with a capsacum or ecdysteroid product comes into play again here. These two essential nutrients are both well known to promote healthy testosterone levels in humans and a large portion of the population consumes a diet containing insufficient levels of them. The Zinc is included in a metal-amino-acid chelated form, which will significantly improve the bioavailability of the zinc. Many of these effects should be noticeable acutely from the very first dose. Find this supplement, and try it. Maybe it will temper your disappointment in other companies and their 'revolutionary' anabolic supplements that turn out to be garbage. 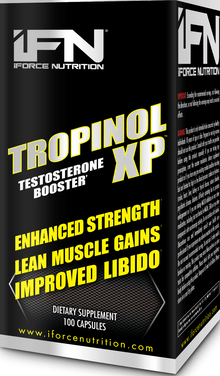 If you want to give Tropinol XP a try, just take a look at the price comparison on this page and you'll be able to find the best price at an online store. Online stores are always cheaper than buying at brick and mortar stores because there is way less overhead involved with running an online store.